Capri is a Mediterranean island of calcareous origin, it is a luxuriant and an extraordinary place with a mild climate. Over the centuries it has been visited by intellectuals, artsist, writers. They were estonished by the magical beauty, by the mix of nature, history and culture. 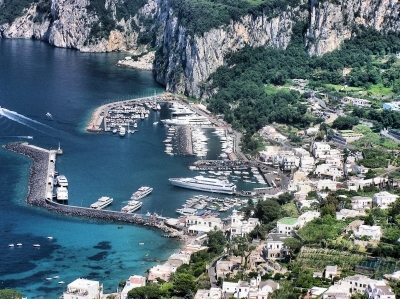 There are almost every day different events, which bring Capri’s legend to life. Capri is a small Italian island situated 5 km from mainland in the Bay of Naples. The island’s beauty has no comparison anywhere in the world and was celebrated since the days of the Bay of Naples. The Roman emperors used to come here, because Capri was their favorite resort. In the Greek mythology was known as the island of the sirens. In our days Capri is world famous and it is visited by tourists esecially in the summer months. Capri is perhaps Italy's most elegant coastal retreat, one of the richest areas for archaeological, artistic and monumental works, a land of great tradition.